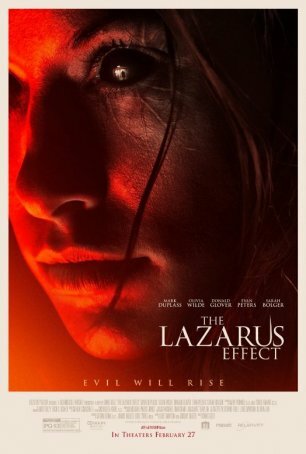 The Lazarus Effect begins with an intriguing premise then proceeds to squander all the early goodwill through a slow, inexorable descent into cheap horror gimmicks. What begins as an intriguing blend of such diverse sources as Frankenstein, the 1990 Julia Roberts/Kiefer Sutherland thriller Flatliners, and a 1966 episode of Star Trek ("Where No Man Has Gone Before") turns into a standard-order assortment of "boo!" moments and freakish makeup. It was probably too much to hope that the high-minded ideals espoused by the early scenes of The Lazarus Effect would make it all the way to the end. This is, after all, a mainstream horror movie of the PG-13 variety and, as such, is subject to the requisite clichés. Perhaps the most disappointing aspect of David Gelb's production isn't the intelligence cliff-dive taken by the screenplay but the lack of suspense and scares. Gelb tries mightily to use jump-cuts, fake-outs, and darkness to enhance the mood and provoke gasps and shrieks, but few of his attempts work. The movie is painfully short on moments of visceral horror and that, coupled with a jumbled and confusing ending, makes The Lazarus Effect a fundamentally unsatisfying experience. The movie opens with a Frankenstein premise: a group of Berkeley grad students and scientists, trying to understand life (and play god), employ electricity in an attempt to reanimate dead animals. They're a tight-knit group: project lead, Frank (Mark Duplass), and his co-researcher and fiancée, Zoe (Olivia Wilde); wisecracking anti-authority figure Clay (Evan Peters); tech-savvy Niko (Donald Glover); and pretty Eva (Sarah Bolger), who's along for the ride as a documentary filmmaker. Their first unexpected success occurs with a canine but, after the Champaign has been consumed, they notice all is not right with the dog. He has no appetite, his neural activity is too high, and he shows signs of aggression. Circumstances force the test to be repeated but, after a lab accident, the subject of trial #2 becomes not another four-legged corpse but a member of the team. And that's where the horror elements kick in. One of the problems encountered by the filmmakers is that the screenplay goes to great lengths to humanize the five protagonists so that when one of them "goes bad" as a result of being brought back from the other side, it's difficult to be frightened by that individual. We're not talking about a demon from hell or a zombie but a human being who, through no fault of their own, has been shocked back to life using a drug that accelerates evolution. One could make a case that the real villains of this story are the scientists. It goes back to Frankenstein: who's the real monster in that story, Dr. Victor or the misbegotten creature he assembles? Would that The Lazarus Effect pursued this question rather than going down the obvious path trodden by seemingly every other teen-oriented horror film. The film's verisimilitude is weak and there's a bizarre subplot involving a greedy drug company that has no purpose beyond setting up the fatal accident. The Lazarus Effect is mercifully short - only about 80 minutes in length - so it's not around long enough to overstay its welcome. The last act is confusing and poorly thought-out, causing one to wonder whether the end result is something the studio tried to "fix" in the editing room. Whatever the case, this film doesn't work as science fiction, horror, or a morality play. It's more disappointing than terrible but the missed opportunities leave a bitter aftertaste.